Plant medicine and foods that help us heal and feel great is one of my most loved topics. The study of plants is called Botany, and use of plants as medicine is called Botanical Medicine. It is also called herbalism or herbal medicine. One of my favourite herbs of all is Zingiber officinalis - Ginger. This interesting tuberous root with a bright golden yellow flesh and a thin tan coloured skin that you can find at your local grocery store is a very healthy choice when making your weekly rounds for food. Ginger grows in warm climates and has a grassy appearance and when wild has a lovely flower; the tuberous root is what we eat and use for medicine. Botanical medicine often employes tinctures which are extracts of plant parts that are mashed up and then soaked in water, alcohol, or glycerites (a sweet plant liquid that makes it easy for kids or people strictly avoiding alcohol to use). Ginger is used as a tincture which can be beneficial since an alcohol and water extract will release more kinds of active medicinal substances, but it can also be used as a tea or a decoction. Teas are a type of extract made passively with either hot (like our favourite Red Rose or King Cole) or cold water. Decoctions are used for thicker tougher substances like the root of zingiber; the ginger root is cut up and peeled and then boiled in water for a few minutes to increase the strength of the medicine. So what type of medicine can you expect from our golden friend Ginger? Ginger has long been used in China as a medicine especially for warming the meridians (channels) and helping deliver medicines throughout the body. It is an excellent aid to circulation and it possesses some minor anti-platelet activity making it a good tonic for people with circulation issues. This time of year people are starting to feel cold and the beginnings of dampness are setting in. 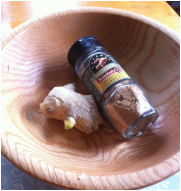 Ginger is excellent for combatting damp cold. In Chinese medicine damp cold could appear as sinusitis, yeast problems, chronic feeling of cold, bloating and digestive issues. Ginger can help with these things as it is not only warming in nature which your digestive tract loves, it is also is a wonderful digestive stimulant. It is a tonic to our digestive tracts because it both soothes and stops spasms along with gently stimulating digestion which is just what most stomachaches need. Zingiber officinale also shows benefit for healing and preventing ulcers. Its historic or traditional use in rheumatism has been studied in a number of placebo controlled double blinded studies for knee pain and muscle pain. In scientific terms it exhibits anti-inflammatory effects via a number of different pathways. In addition ginger has great anti-oxidant activity which is so important in any chronic disease and in the maintenance of good health. Oxidative damage is caused by free radicals which are the biproduct of normal cellular metabolism or combating a virus or lingering bacteria. When we run short on a good supply of anti-oxidants damage is done to healthy tissues - even when those free radicals are created as a result of the body doing its job cleaning house. Some of gingers other great properties include improving gall bladder and liver function, benefiting the cardiovascular system, improving lipid profiles and staving off migraine headaches. Not to mention its most well know and studied medicinal properties of preventing motion sickness and treating nausea and vomiting of pregnancy. As you can see Zingiber officinale has definitely got serious medicinal zing! I know it almost sounds too good to be true; every time I read about Ginger I am re-amazed. I’m sure it’s easy to see why this beautiful spice has earned a special place in my home and why I drink and eat of its golden goodness so often. I hope you find some time to experiment with it in the kitchen as you sauté up some veggies, or make delicious soup like carrot ginger, or as a new daily decoction to rotate with your favourite warm beverage.